I can say with positivity that a good amount of American’s enjoy going to sporting events and eating a hot dog & beer. Nearly every single food stand sells both hot dogs and beers. I do see how this combination is quite popular. Hot Dogs were one of the first items to be sold at baseball games and the popularity has never stopped. While I am an American, I do not eat hot dogs & I do not drink beer. Rather than throw back a cold one while eating a mix-o-meats, I opt for one item whenever I can – a Soft Pretzel. No matter what the sport or the event, if the location is selling Soft Pretzels, you better believe this chica is going to get herself one. To me, nothing beats a Soft Pretzel at a sporting event. While a majority of these pretzels are good, I have come across some really bad ones – Tampa Bay Times Forum, I have also had some amazing ones. On one occasion, I had the absolute best soft pretzel ever. The location was Tropicana Field. The event was a Tampa Bay Rays vs Atlanta Braves. The item was the best Soft Pretzel ever. The shape, purely a Super Twist. This, my dear friends, will be the subject of this review. I was surprised when I walked up to the concession stand at Tropicana to find soft pretzels that were not the norm. Rather than the traditional pretzel shape, these pretzels were a Super Twist. Baked up in a braided format, these pretzels were long and looked great. I paid my $4 dollars (it may have been $5…I don’t recall) and was not given the option for salted or unsalted. Normally, you get the choice and I always go with unsalted. It’s not that salted is bad, it is just that it it too salty. I normally scrape off most of the salt and continue on. This was no issue as I was handed my soft, Super Twist pretzel. Before I even made my way back to my seat, I took a bite of this pretzel. While the shape was unique, the taste was familiar and fabulous. 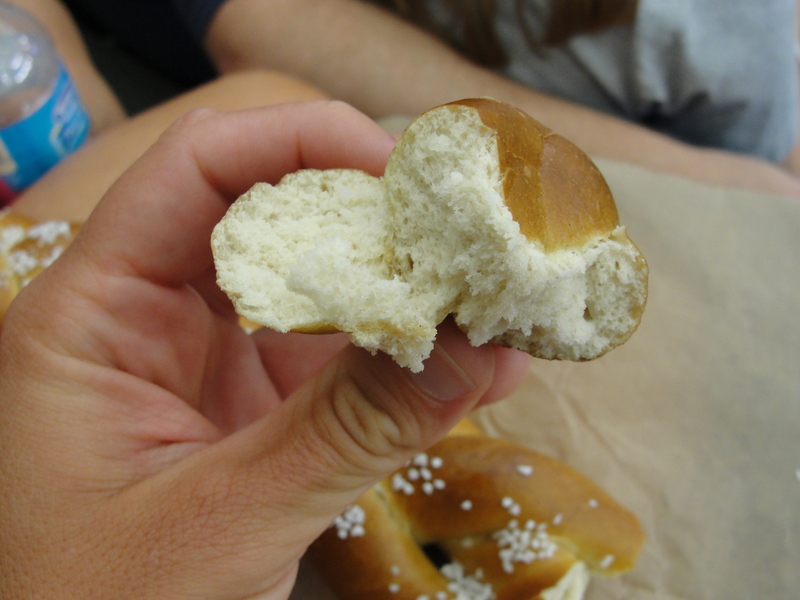 The exterior of the pretzel was just a tad crispy while the interior was soft as soft can be. My first bite was absolutley delicious and I can still recall the taste. Once I got back to my seat, I continued to eat my Super Twist and found every bite to be just as good as the next. The interior of the pretzel was so soft and the taste was spot on. Similar to a doughy bread, the pretzel had a semi-sweet dough that melted in my mouth. While the exterior had just a touch of crisp, it wasn’t really crispy or hard – no complaints with this. The exterior had just as much flavor as the interior but the texture was indeed different. This Super Twist was your basic SuperPretzel but, it tasted way better. I ate basically my entire pretzel plain – the only way I normally eat one. I did have some mustard for another item we were eating, and dipped a piece of two into the mustard. While the mustard did provide additional flavor, it was so not needed – the Super Twist itself really reigns supreme. As I finished off this pretzel, I really wanted another. As we were going to be at the game for a while, I thought quite a few times of going back for another. Looking back now, I really wish I would have. That’s how extradionary this pretzel was. 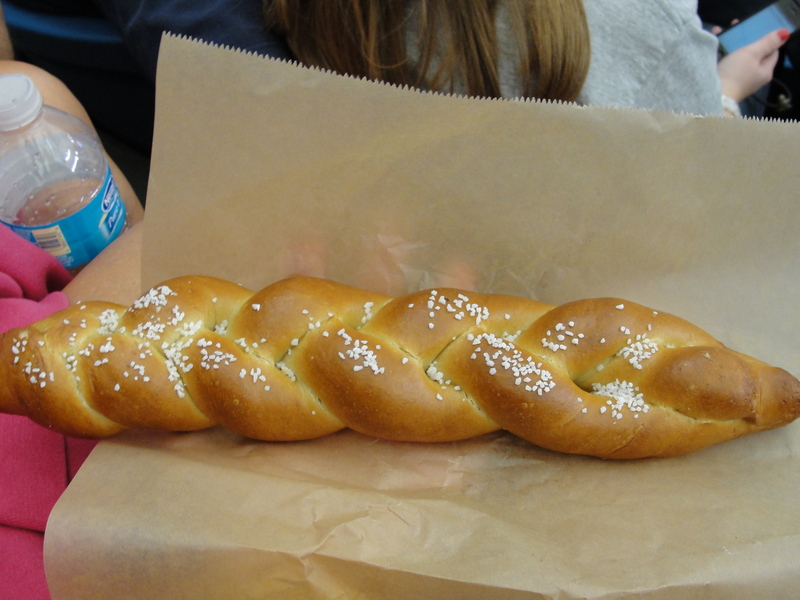 While I rarely ever visit Tropicana Field – baseball should be played outdoors – I kinda wish I had a reason to go back so I could get this pretzel. As this was my first MLB game of the year, I thought maybe the Super Twist was a new item all stadiums would be having. But, I have since been to two more games and no luck at either. This Super Twist not only had a fun shape, it also had the familiar, wonderful taste of a soft pretzel. Call me un-American with my non-drinking non-hot-dog-eating self but, I guarantee, you try this Super Twist and you will sway the way I do.